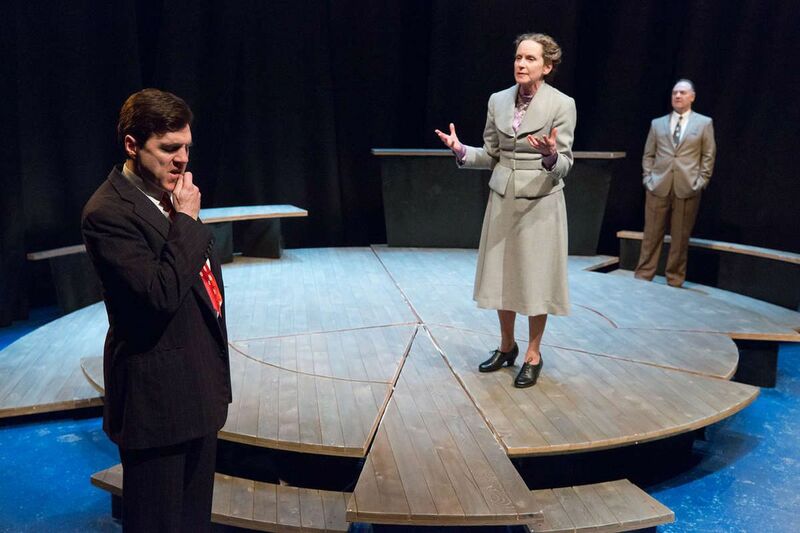 (Left to right:) Charles McMahon as Werner Heisenberg, Sally Mercer as Margrethe Nørlund Bohr, and Paul L. Nolan as Niels Bohr in the Lantern Theater Company’s production of “Copenhagen,” written by Michael Frayn and directed by Kittson O’Neill, through Feb. 18. For a brief two hours and 40 minutes Wednesday night, three actors held the Lantern Theater audience in the taut grasp of Copenhagen by Michael Frayn. It was just extended to Feb. 18, and I can see why. It's a superb rendition of a work of resounding significance. Copenhagen sometimes is called "the best play ever written about science." Maybe so, but you don't really need much science to be swept up. Be it 1941, or 1947, or 1927, what this play is about – not about, I hate that locution – what this play is is our lives in this world. Much, much honor to Paul L. Nolan, who plays Danish physicist Niels Bohr (discoverer of "complementarity," one of the pillars of quantum physics); Sally Mercer, piquant and relentless as his spouse and amanuensis Margrethe; and Charles McMahon, artistic director of the Lantern, stepping onstage as German physicist Werner Heisenberg (discoverer of the "uncertainty principle," another crucial pillar). All are utterly persuasive in demanding roles. As McMahon told me afterward, this play is written in a series of repeats subtly varied, and the actors face lengthy, rich speeches without a word out of place. Kittson O'Neill's direction is unerring, and Nick Embree's bare yet eloquent set suggests subatomic forces at work around and within. We're in the afterlife. The Bohrs look back on a 1941 meeting in Copenhagen with his star pupil, Heisenberg. Nazi Germany has occupied Denmark, which, to say the least, complicates their meeting; it's certain Heisenberg has been followed and that Bohr's house is bugged. But why did Heisenberg come to Copenhagen? All three try to answer. But they need repeated "drafts," revisit and revisit the moment. What they discover is that, just as in quantum physics we cannot know both the exact position and speed of any particle we are observing, we cannot really know why we do what we do. We can tease out strands. Each character contributes. (Margrethe wields some of the most devastating observations.) But where they lead, in an ineffable last half hour, is the understanding that we elude ourselves. This is crushingly tragic. Especially if, for towering minds like Bohr and Heisenberg, control, clarity, and understanding are all. Heisenberg is fond of declaring, "It works!" But that's not enough. Bohr: "I have to say – if people are to be measured strictly in terms of observable quantities … " Heisenberg: "Then we should need a strange new quantum ethics." Frayn sets one in motion, as both Bohr and Heisenberg glimpse their personal responsibilities for mass destructions both imagined and real. As in Julius Caesar, every move is freighted, every word watched. The stakes could not be greater – as in the fate of the world. Yet it lies in hands that cannot know what they do. "Before we can glimpse who or what we are," a stunned Heisenberg says, "we're gone and laid to dust." Yet the moral sense of Copenhagen is keen, vibrant. It's Heisenberg, clueless as he sometimes is, who says, "[I]t would be another easy mistake to make, to think that one loved one's country less because it happened to be in the wrong." Gasps from the 2018 audience. Go see Copenhagen. What it comes to show us may be dark, appalling, but – what genius – we leave with elevation, a vision, a thrill in the dark. Through Feb. 18 at the Lantern Theater Company. Tickets: $15-$39. Information: 215-829-0395, lanterntheater.org.